In this series: I am tracing my Irish roots and trying to pinpoint what part of the Emerald Isle my ancestors hailed from. Learn more here. Where I left off: In my last post, I talked about a new DNA match who descends from Bartholomew of Bayonne and went into detail about my analysis of our shared DNA. In the end, I was able to eliminate several lines of my family tree as possibilities of our shared ancestor, and formulate a targeted testing plan to further test my hypothesis. In this post: Since I know that my targeted DNA testing plan will take some time to complete, I want to go back to my paper trail and answer some open questions. The first open question I want to focus on involves Bartholomew’s oldest son and my 2x Great-Grandfather, John. I want to know what happened to John, where he died and when, and where he’s buried. In Part 4 of this series, I talked about the many challenges I faced in my previous research attempts to find what happened to John. Read more of that background information here. Where I left off: In my last post I talked about a new DNA match, “MJ”. MJ had a family tree that went back to Bartholomew of Bayonne, the person who I suspect may be my 3x great-grandfather. I was able to independently verify her tree and show how this DNA match was related to Bartholomew. I also talked about the possible relationships between myself, my dad, and MJ based solely on the amount of DNA we share. But just because we all share DNA and have someone in our tree named Bartholomew McDermott, doesn’t mean it’s the same Bartholomew. Now I need to do additional analysis of the shared DNA to not fall victim to confirmation bias. In this post: I plan to do a deep dive into the shared DNA and develop new evidence to find our common ancestor. My first step will be to eliminate as many lines in my tree as possible, then create a targeted testing plan to determine if we both descend from Bartholomew of Bayonne. I concluded that the only evidence I had of this father/son relationship was a name, approximate age, and location. There was no direct evidence of this relationship, and the indirect evidence was rather weak. But before I could write off this possibility, I got a new DNA match who descended from none other than Bartholomew of Bayonne. In this post: Now that I have this new DNA match and potential connection to Bartholomew of Bayonne, I need to independently verify the family tree of my new DNA match. Where I left off: In my last post, I talked about my struggle to find my 2x Great-Grandfather’s death certificate. I knew there was a good chance John’s mother’s maiden name and birth date would be written on the certificate. If so, then I could compare that information to his marriage record, and ultimately confirm I had the same John that was baptized in the Kiltoghert parish of Leitrim in 1843. In this post: Because I had hit a dead end trying to find John’s death certificate (or even his death year), I wanted to expand my search to his FAN club to Bartholomew McDermott and his wife Catherine. After all, who could be better to start with than John’s own parents? Where I left off: In my last post, the third of this series, I located a baptism record for a John McDermott in the Irish parish of Kiltoghert1. The year, location, and parents’ names were all a fairly good match, making the person a prime candidate to be my 2x great-grandfather. However, the mother’s maiden name on the record was a different spelling and the birth year was a few years off from census records. I needed more information and evidence to connect the person in the baptism record to the John McDermott of Newark, NJ. In this post: With a possible baptism record for John in hand, I needed to gather more information to conclude I had the correct John. I wanted to find John’s death certificate, which would most likely list his parents’ names. From there I’d be able to compare his mother’s maiden name to the names listed on his baptism and marriage records. 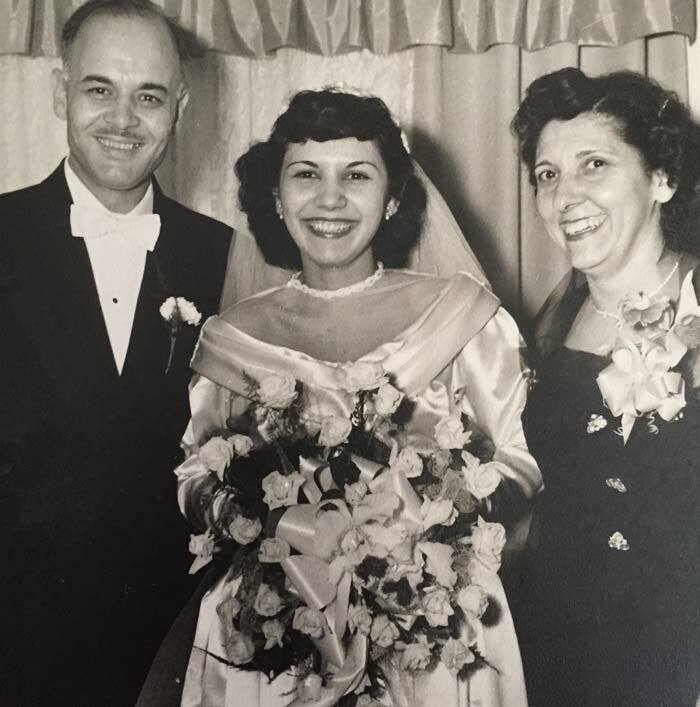 Where I left off: In my last post, the second in this series, I walked through the process of finding John and Annie’s original marriage record in order to determine the names of John’s parents. I concluded that their names were likely Bartholomew McDermott and Catherine Gahan and that John was likely born in County Leitrim ca. 1844. In this post: Now that I know the likely names of John’s parents and the approximate year and county of this birth, I want to find John’s baptism record in Ireland. There are a few photos in my grandparents’ wedding album that include my great-grandfather, Giuseppe Bombino. To me, he looks young to have a daughter getting married, despite a much-receded hairline. From one picture he beams at the viewer like a happy host on a happy occasion. He is dapper in a tux with a white bow tie and has a smile on his face and in his eyes. Or maybe that’s what I’m reading into his expression based on what I’ve heard about him over the years.